Where do seniors turn when they need a roommate? Janice Raiford, left, and Lillian Otero, right, met through the Home Sharing program. Eagle photos by Victoria Merlino. Janice Raiford, 70, had lived alone in Queens Village for over 20 years before she decided she needed a roommate. She had retired, and didn’t want to sacrifice the things that she loved — going on vacation, shopping, going out and having fun — to pay her rent. So Raiford turned to the Home Sharing Program. Facilitated by the nonprofit New York Foundation for Senior Citizens, the program matches “hosts” with extra rooms to “guests” who are looking for housing, with the caveat that at least one person of the pair be age 60 or older. While sometimes two seniors are paired, other times it is a senior and a younger college student, or a senior and a middle-aged person. The foundation positions the Home Sharing program as a way for seniors to get relief from the city’s high housing costs while promoting companionship, reducing loneliness and maintaining senior independence. For Raiford, this extensive matching process took a couple of months. 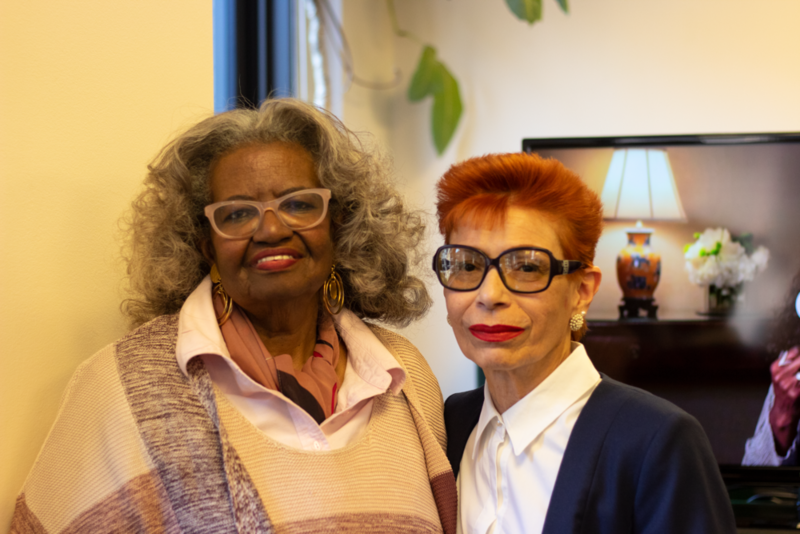 Staff in the program soothed her fears about bringing someone she didn’t know into her apartment, and Raiford’s adult daughter in Florida even interviewed a couple of prospective candidates through FaceTime before they found her perfect match: Lillian Otero, 67. The house Otero had been living in had been sold, and she had to move. She too turned to the Home Sharing Program. Disco singer Gloria Gaynor was recently named a spokesperson for the Home Sharing program. “Trust me, I’ve got a family, a lot of friends, [I’m] involved in organizations. So I wasn’t looking for no friend. But guess what I had? I’ve got Lillian. She is fabulous,” said Raiford. The Home Sharing program bills itself as a solution to many of the problems that seniors face in NYC — especially the affordable housing issue in a city where the average rent for a two-bedroom apartment is $3,800 per month. In Queens specifically, that number is $2,660, according to a study by SmartAsset. There are 1.64 million adults over 60 in NYC, comprising 19.2 percent of the city’s population, according to the Department for the Aging, and that number will only continue to grow. “By 2040, one in five New Yorkers will be 60 or older, so now’s the time to rethink the traditional structures that determine how we age,” said Acting Commissioner of the New York City Department for the Aging Caryn Resnick. “Home sharing really highlights this administration’s commitment to addressing New York City’s affordable housing crisis in innovative and creative ways,” Resnick added. For Otero and Raiford, they are just happy they found each other. “If it wasn’t for this program, I don’t know where I would be today,” Otero said.